As you all know, KREATOR were hard at work in Berlin recently on an album dedicated to the large following the band have built up since they started. This album is the fruites of all that activity in the early hours of the Berlin morning and it lives up to everything the band promised. Maturity couple with a creditable, simplicity and excellent production from Randy Burns has given this album a lot of life, and the processes that have been started here will hopefully permeate KREATOR's music for some time to come. Lyrics, another powerful performance from Mille as always, could seem to be sligthly pessimistic, but musical content will lift your hearts. 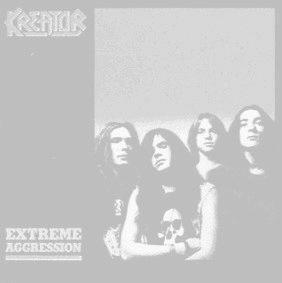 My favourite moments are the very mature "Some Pain Will Last" and the catchy riff of "Bringer Of Torture", but there's also some excellent combination of "Terrible Certainty" and "Pleasure To Kill" styles which prove that KREATOR, while not having lost the feel for those LP's, are keeping them up-dated ("Extreme Aggressions"). KREATOR wouldn't knock me too hard if I said they'd gone back to basics on a few tracks - "Stream Of Consciousness" and "Betrayer" - but the feeling is firmly entrenched and I feel that it's the power, honesty and feeling that the band are trying to get across, not just their now undoubted ability in this field. Production is a big bonus, guitar sound is mean and if you're looking for depth and durability in an album, then this is for you!! Fill in all the space on the scoring thermometer Bernard!